The Leapfrog VBP Program helps health plans, employers, and other large purchasers identify the highest value hospitals in individual markets and across the country, based on results of the Leapfrog Hospital Survey. The program can be implemented quickly with minimal burden on plans. The program makes it simple to identify hospitals that have attained top performance or made significant improvement from one year to the next, and provides a transparent and effective payment methodology to drive further improvements. Health plans that utilize the Leapfrog VBP Program request that hospitals in their network participate in the annual Leapfrog Hospital Survey. Leapfrog applies its VBP Program methodology to hospitals' Survey Results and gives each facility an overall Value Score. The Value Score enables the plan to rank the hospitals and set benchmarks for financial awards or incentives, such as allocating the highest rewards to hospitals scoring in the top decile. All participating hospitals receive a report detailing their Survey performance and results twice per year. 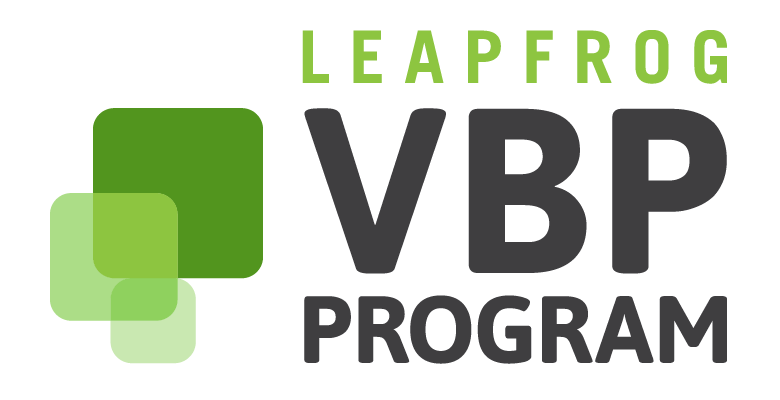 View a sample Leapfrog VBP Program report. Designed by a national steering committee of health economists, leading employer representatives, researchers, and academics who stand behind the methodology and Leapfrog’s scientific integrity. Hospitals are benchmarked regionally, within networks, and nationally. Simple and quick implementation using a predetermined methodology that relies on results of the Leapfrog Hospital Survey as the single data source, minimizing hospital burden. Involves hospitals by providing a report that enables payers and purchasers to discuss quality and safety performance with hospital leaders and set specific goals for improvement. Evidence-based, nationally standardized measure set. Allows payors to customize program components, including eligibility and payments. Calculates five domain scores on key elements of performance – medication safety, inpatient care management, maternity care, high-risk surgeries, and hospital-acquired conditions – as well as an overall Value Score for each hospital. Ready to implement a value-based purchasing program? Let's start a discussion on how the Leapfrog VBP Program can work for you.